Nom nom nom. Get in my face dinner. How to cook a piece of salmon is easily the question most asked of me in every kitchen I’ve worked in for the last 5 or 6 years. That and duck. 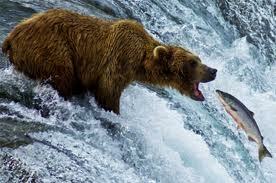 Bears don’t normally eat duck. I guess practice would be the answer if you had the time (and a lot of salmon going through your kitchen), or maybe like the bears do it and don’t cook it at all. But if these options don’t suit you, we’ll try to take it from page to plate with minimal wrongnesses. This salad also goes great guns by itself with a good hit of the yoghurt dressing. Now plate that puppy up. Salad down first, followed by the salmon and lastly a nice big dollop (real good kitchen speak) of yoghurt dressing.